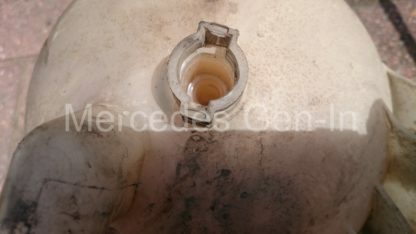 The later Mercedes Sprinter and Volkswagen Crafter (and probably many others) uses a round plastic header/expansion tank in the coolant system. 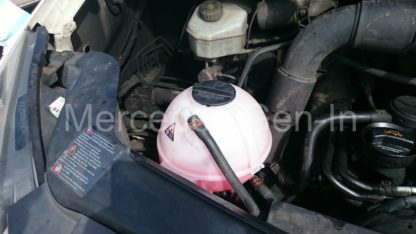 This nylon spherical tank houses a rather clever float level switch that not only indicates a ‘low fluid level’ but also will illuminate the warning lamp in the dash binnacle if the ‘specific gravity’ of the coolant is less than specified – indicating to the driver that all is not too well with the coolant circuit. On one of the fleet Crafter vans the coolant level warning lamp had come on and the driver had reported the fact. When I investigated the issue there was no warning light on the dash, water level was fine but it could be clearly seen that the float inside the header tank had broken up, the plastic becoming somehow brittle and breaking away from its vertical retaining slide/guide. The internal float section is not available as a separate part so a ‘used’ second hand bottle was purchased. 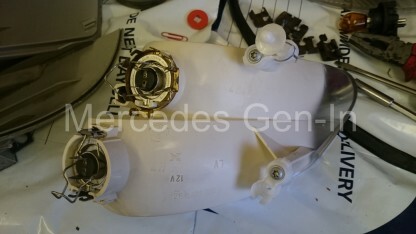 After disconnecting the electrical connector at the base of the sphere, it is possible using a couple of sets of brake hose clamps to remove all the rubber hoses from the bottle in situ. 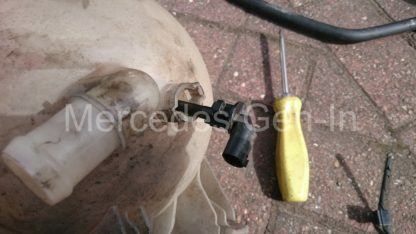 Once the single torx screw has been removed from the bottle mounting foot, orientating the bottle directly down into the void beside the engine, the connected hose-work can be removed quite easily and the bottle withdrawn upward without losing almost any coolant. What coolant remains in the expansion tank can then be decanted back into the new bottle once fitted and piped. On closer inspection once the bottle was removed, it could be seen that although the float inside the expansion tank was in this case the obvious problem (the actuating magnet it transpired, had been removed from the loose float by the driver, to turn off the lamp – why do they do that!) Further dismantling of the float switch and level sensor revealed exactly how it functioned and also highlighted a further weaknesses that could in some cases cause issue with level measurement and warning lamp activation. In the base of the tank is a moulded central vertical column that forms an upright guide that the tubular float moves on. The float rides up and down this central guide tube. Beneath and fitting into this tube is the sensor device. 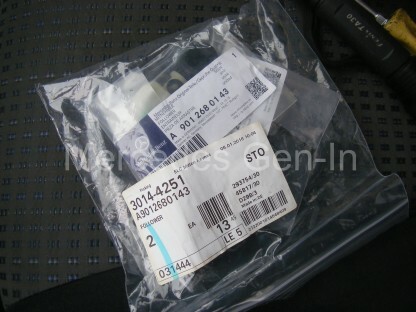 Although moulded in a plastic holder, this sensor is actually houses a small glass tube type reed switch that is triggered by the passing float (and magnet). The contacts of the reed switch close as the float magnet descends past a predetermined point and the warning lamp is activated. As the float rises above the reed switch, the magnet no longer causes the contacts to close and they spring open, resulting in extinguishing the coolant warning lamp. There is a small resistor across the contact terminals of the sensor (around 800 ohms – the one I measured) This I am certain enables the ECU to detect in addition to reporting the coolant level status, a disconnected plug to the sensor, as it would have four possible measured electrical ‘states’ present between the sensor terminals as measured from the ECU. (1): Reed switch contact open, 800ohms = Correct fluid level. 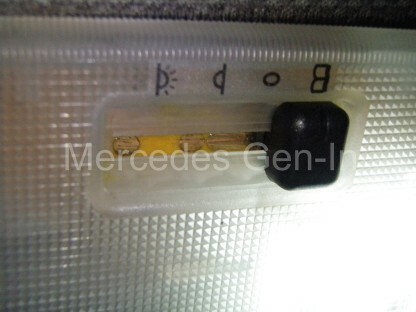 (2): Reed switch contact closed, short = Low fluid level or weak antifreeze water mix, Warning lamp lit. (3): Open circuit = Connecting cable disconnected or cut, warning lamp lit. 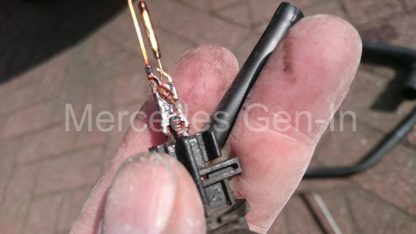 (4) Cable shorted together = Connecting cable linked or fused together, warning lamp lit. It can be seen from further ‘distructive’ disassembly the level sensor that it is susceptible to corrosion around the resistor and wire junctions, obviously due to the service environment it which it lives. This discovery is important as if the float inside the water tank looks in good order, it may just be that the level sensor is faulty. Depending on how keen you are with your fault finding, you could just slot a 1k resistor across the sensor plug and see if the warning lamp extinguished. If it does, the chances are the sensor is faulty and can simply be rotated through 90 degrees and removed from the bottle base without any draining down or tank removal. 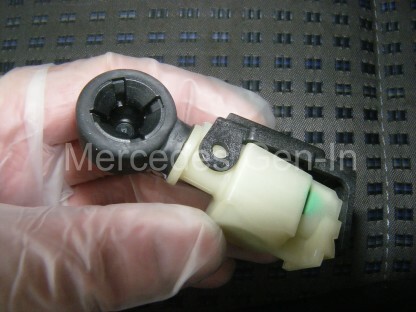 Slotting in a working sensor, turning and reconnecting its plug to fit the replacement part. Hopefully by exploring a little deeper how the float level switch works gives you a better understanding should you ever needed to trouble shoot the circuit. 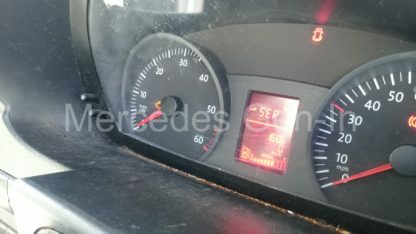 The coolant level warning lamp is extinguished on the dash as you can see below, however you may notice the engine management lamp illuminated just behind the speedo needle hub – this is due to a faulty glow-plug and is next on the list for repair! 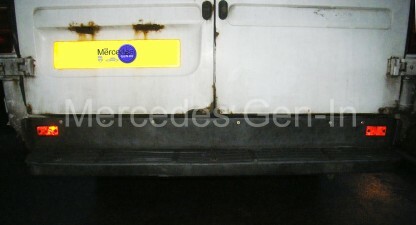 As time passes the pressed steel under step or supporting chassis beneath the Sprinters rear step plastic skin rots. It is only relatively thin gauge steel, with most of its strength gained from its pressed shape and side wall returns – it gets fragile and flexible to tread onto, often pulling away the vertical face of the step skin from the clips in the rear valance. Once this happens it is time to repair. On one of the courier fleet, the step had been requiring repair for a few months and just to help it on its way the driver reversed it into a bollard and creased the edge quite severely. 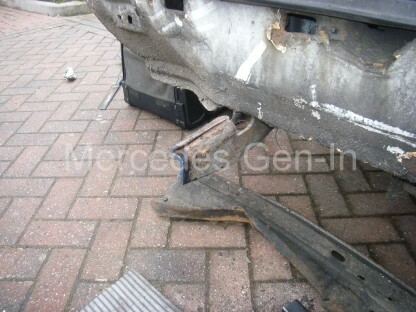 So bad in fact that the plastic skin was removed in the impact, leaving the full horror of the rusted and now damaged rear step requiring urgent attention. Taking a hacksaw and chisel to the existing step plate made light work of cleaning up the area, leaving the two steel supporting brackets projecting from the chassis. (Hammered straight again!) Once the covering had been removed a section of 50mm square box section was cut to fit between the support brackets. A further length of 50×50 was cut to fit snugly inside the rear edge of the plastic skin, ending at each side just before it takes on the radius into the corner and edges of the step moulding. A centre line was marked onto each section to use as a datum on assembly and welding. The edges of the chassis support brackets were cut back by 50mm to allow the new fabrication to sit where the original edge would have supported the plastic skin and to allow as good a fit as the original. Cleaning up all areas to be welded with a grinder including the support brackets and mating edges of the two box sections, in addition to the areas where the two pieces are to be stitch welded top and bottom. Aligning the two centre marks, tack the box sections in place ensuring that it is both, level central and flush between the chassis support brackets. You should be able to weld the shorter box section to the supports along the top, back and at the rear corner of its section. Then clamp on the longer section, ensuring it is central, then stick weld this to the shorter box previously welded. 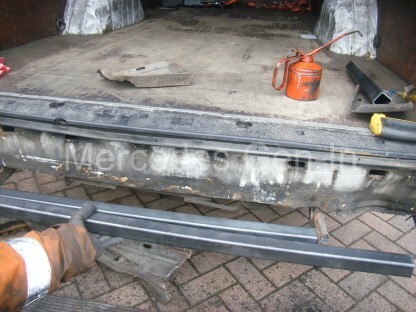 Once fully welded, the construction is very strong and will support a great deal of weight, certainly it does not ‘flex’ like the original used to do when entering or exiting the van. 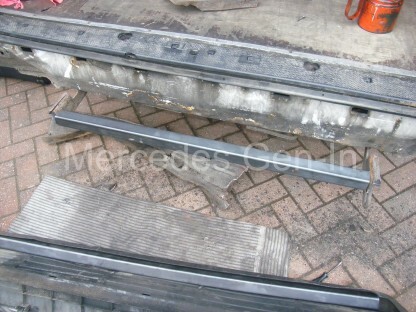 Cleaning off the rough edges and painting if required prepares the new step tread for re-fitting of the plastic skin. 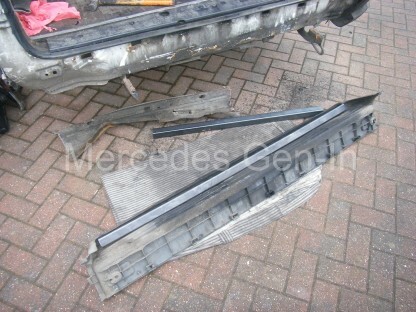 This can be slid over the new steel and secured back to the upright section of the rear valance. 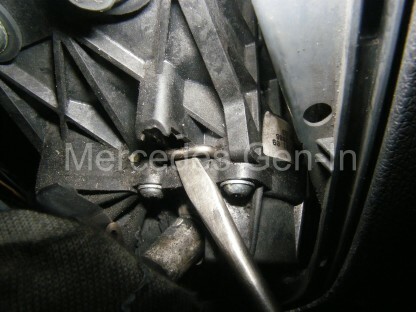 If, as in the case of our step, the moulded retaining clips had been broken, large head self tapping screws were used to secure the vertical section to the rear of the vehicle. Additionally three 8mm holes were drilled vertically through the foot-plate area of the plastic step to coincide with the new steel box section beneath. The step was secured with coach bolts and washers, tightening them securely to finish off the job. 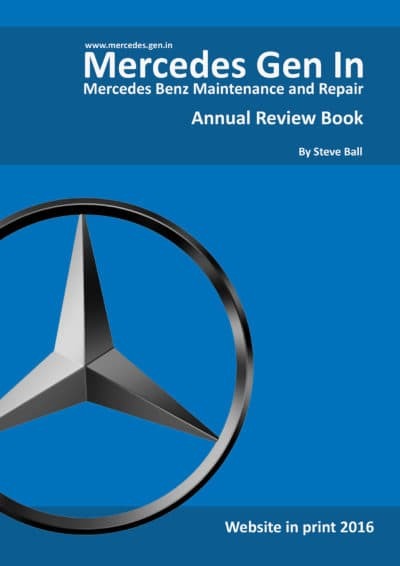 The repaired step is in my opinion stronger than the original and hopefully will give many years good service – unless of course it is used to determine the rear extremity of the vehicle in a parking manoeuvre, where it will not be quite as ‘forgiving’ as the slightly flexing original! From time to time we get a call from a driver saying that he can’t select any gears and the gear stick (Manual Gearbox) has gone sloppy. Quite often we direct him to sliding underneath the left side of the van and reconnecting the ball joint end back onto the gearbox selector mechanism, at least to get him home and save recovery. 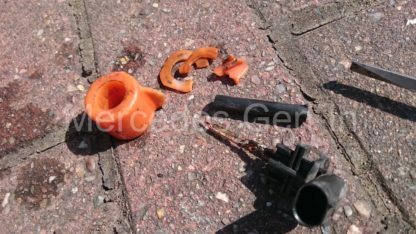 Once either or both of these plastic adjustable ends wear beyond a point where they no longer ‘snap’ onto the steel balls of the selector mechanism, its time to replace them as they will let you down. All you need to do to install these correctly, is elevate the vehicle enough to gain access to the underside at a point on the side of the gearbox case, just rearward of the front left wheel. Slip off the gearstick gaiter in the cab and push down the steel locating staple on the gear lever to set and lock it at its mid-position. Now get underneath and pull/lever off the two old ball joints from their respective positions, one on top and one to the side. Release the grip latch that traps the cable ‘ribbed rod’ end from each balljoint, this is used to adjust the effective cable length and position the gear cable in its correct position. Once the latch is undone the end will simply pull off the ribbed rod of the cable end. Installation of the new ends is straightforward. 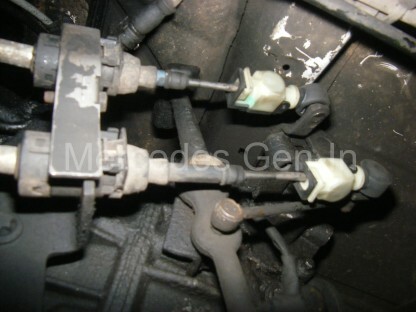 Ensure the selector mechanism on the gearbox is in its neutral at rest position. Undo the latch on each of the new balljoints and thread them onto the ribbed adjuster rod moulded onto the end of each selector cable. Use slide or pipe pliers to squeeze the new ball joints onto their respective male steel ball towers. Align the gear mechanism to its central rest position and use the pipe pliers as before to squeeze together the latch that grips the adjustment rod. It will click when it is in its final position and you will see that the latch clip is fully engaged on the front face of the moulded body (where the cable enters). From the cab, withdraw the steel centring pin (Staple) from the gear selector lever ball, ensuring it latches out of the way, back into its little indent in the upper part of the moulded body. Test gear selection. If all is well, start the engine and road test. Further adjustment should not be necessary, however if needed, the ball joint end/cable clamps can be simply unlatched with a screwdriver, thus allowing the bar on the cable end to be slid either further in or out of the ball joint body, before re-clamping to secure the adjustment. 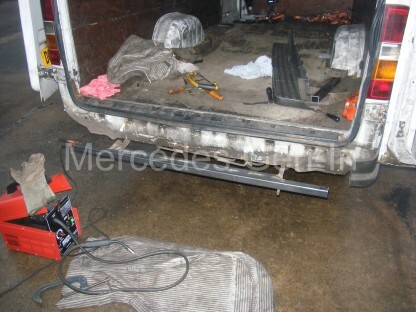 Having a large fleet of Sprinter vehicles running on delivery routes has its problems and one reoccurring issue is the cargo area lighting being left on over the weekend and flattening the battery. Come six o’clock Monday morning the driver rings the boss to say his vehicle wont start off the lot. The issue really is I suppose mainly that the cargo area door pin switches get damaged both through worn fold back rear door hinges and clumsy forklift loading, worn ill-fitting doors continually not helping the situation. 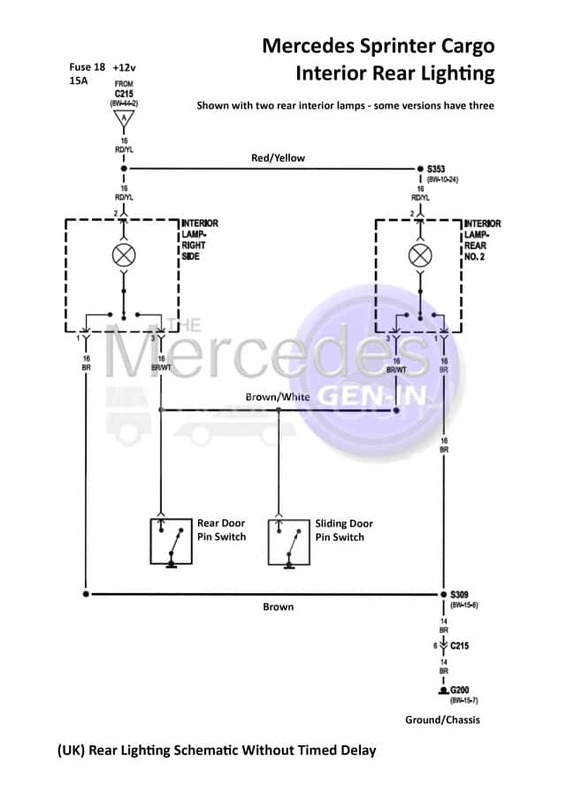 What happens is each of the rear interior light unit switches gets set to middle position (off) during the day and as unloading at the depot is done in the evening the switches are moved to the permanent on position to illuminate work. Obviously this is forgotten about when the doors are shut and they drive back to the parking lot at the end of the day. The van is then locked, keys placed at the lodge and off home the driver goes – lights still on. So how do you modify the rear interior lighting so this does not happen? Lets take a look at how the current set up works. There are three wire terminations to the rear of the lamp assembly; these are plugged into the loom via a three pole-latching plug. 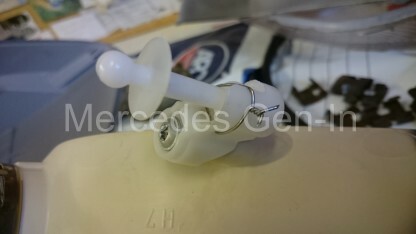 To gain access to the rear of the unit and the connector, use a screwdriver to prize the right hand edge of the plastic lamp to the left and lever it out of the pocket in the steel body. Be careful as the central copper band you can see on the back of the lamp is live 12v supply and can short on the body if you do not observe some caution when taking out the lamp unit. Once out of the body you can identify the wires into the plug by the following descriptions. What was required was a way to indicate that the rear lamps were on behind the full bulkhead from the driver compartment, even better if all the lights in the cargo area could be isolated (switched on and off) from the cab. 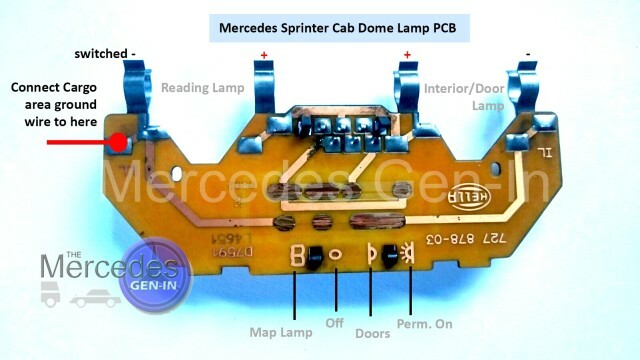 Investigation of the dome lamp in the cab area found that it had two lighting circuits included within. The first, left hand lamp in the dome operates like the rear cargo lights, switch positions for Off, On, or On with front cab doors open. If you were to push the slider switch to the (Book/Map Icon) this illuminates a separate lamp in the dome that is magnified with a clear lens for map reading – adapting this switch position to control all the rear cargo lights is a perfect solution as it provides manual control and a visual indication (map light) that the rear lamps are powered. Turning off the map light in the cab ensures all the rear lighting is off and not draining the battery unseen. Because all the interior lamps are fed with a constant supply to their switches, grounded by either a door opening or selecting ‘ON’ on their individual switches, lamp control can be done in two ways. As the live supply is common and fused through Fuse 18 (15A) any switch in this circuit would remove power from all interior lighting, including the front dome lamp. Power to the cargo lamps is split into two sections of loom running down both the left and right side of the vehicle on the mid level box section, so adding a switch to live supply here is not straight forward. The solution is to switch the grounds to all rear cargo lighting from the front dome lamp when in the ‘map reading’ position. To achieve this you will first have to run a new common cable between all lamps that will become your cab-switched ground. 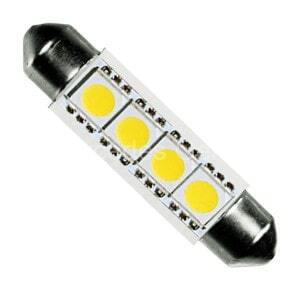 This can be fed down the cab headlining to exit at the dome lamp and run to each of the rear lights in turn. It is possible to thread the wire over and inside one of the roof supports to reach the light behind the sliding door pillar. 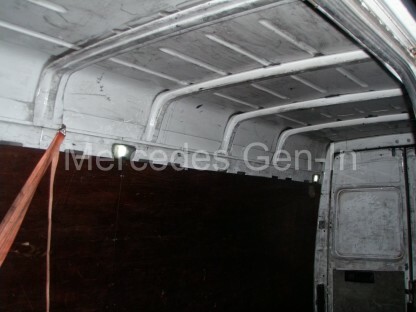 Because of the repeated damage to the pin switches on the doors and the nature of the use of the vans for multi-drop delivery, we no longer required the lights to come on with a door open in the rear area. What was preferred was that the driver switched on the rear lights from the cab before entering. Once he got back into the cab he would turn off the lights on the dome light switch. Should he leave the lights on in the rear the front map light would be illuminated warning him to the fact. Modifying the connections to each the rear lamps was simple. Cut the Brown/White wires from the plug and tape the ends, this disconnects the door pin switches. Then cut the existing Brown (ground) wire a couple of inches back from the connector and tape the loom. Now connect your new common ground to the short stub of brown wire from the plug using insulated wire-crimps. Once all three cargo lights have been modified place their wheel switches into the permanently on position. 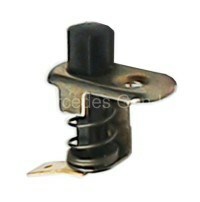 Each lamp can still individually be turned off and isolated if needed by selecting the middle or door pin position. Having dismantled the switch and looked how the switch functions I have determined that this point gets grounded when the switch is placed in the map light position – perfect for what we require! You could if you wished check this out on your own dome light with a test meter just to confirm your configuration is identical. Once connected, the front dome light can be clipped back into position. We decided to replace the existing festoon bulbs with LED types. This has two benefits for us. The first is that the light from the lamps is brighter than standard bulbs and also the total current drawn is substantially less, further ensuring that there is no chance of overrating the front dome light switch. 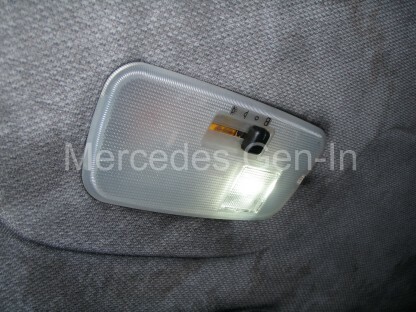 LED bulbs were fitted to the rear light units and they were tested and clipped back into place. It worked perfectly. A few moments with the driver to explain how the new lighting worked and they were pleased with the outcome. As the vehicles are parked on a secure compound at night we briefed the security guard that should he see any interior lamps showing on in the cabs after dark (that he can see from his lodge) he would turn them off. We now know that with this modification that if there is no light on in the front of the cab the cargo area is also in darkness and we are doubly assured the van will start with a healthy battery after standing a few days. This modification may not suit everyone’s application but for the delivery vehicles on our fleet it was well worth the one-hour investment to modify the circuit. It is also unsuitable for later models fitted with interior light delay timers, as they are more complex and controlled by an electronic module and would not lend themselves to this type of modification.